The German/Czech/Austrian co production Habermann tells a chapter of German history which is easily forgotten. The movie is based on a true story and tries to exemplify the destiny of the Germans living in Sudetenland. This is one of those movies which touch on a historical fact which is so painfully absurd in its arbitrariness one can hardly believe it. Habermann is a rich mill owner in Sudetenland. The tragedy of the Sudetenland was that it belonged to Czechoslovakia before the war but almost 90% of the people living there were Germans. When Germany decided to annex the Sudetenland in 1938 this posed a huge problem to people like Habermann who lived peacefully with the Czechs. Habermann’s best friend is a Czech (Karel Roden), many of his mill workers, his accountant and other people in important positions are Czechs. Being so friendly with the Czechs makes him look suspicious to the German authorities who take up residence in the small village in which he lives. When the despotic and sadistic Sturmbannführer Karl Koslowski (Ben Becker) arrives in the village, things go from bad to worse. He wants Habermann to get rid of the Czech workers, spies on him and the Czechs, bullies and controls him. But the worst isn’t even known to Habermann and his wife yet. Although she grew up as an orphan and was brought up by Catholic nuns, her father was a Jew. When Koslowski finds out, the tragedy cannot be averted. Another dramatic story line circles around Habermann’s young brother you joins the Nazi’s. There were a lot of things I liked about this movie and the story of the Sudeten Germans is a story which needed telling. The real tragedy for most only started after Germany lost the war and the Czechs turned against them. This drama is shown well but what I didn’t find too good is that there is too much emphasis on the character of Koslowski. Ben Becker is one of my favourite actors and I watch every movie he’s in. I think he is simply brilliant but he is also the type of character who just crushes everyone around him. He is often chosen to play a nasty Nazi villain and does that well, only giving him this role, putting so much emphasis on this characters, almost makes you think that the whole tragedy was linked to this one man while this was a collective tragedy and not just related to one sadistic character. Still overall I think Habermann is well done, not one of the best but a very watchable movie and the actors, Ben Becker, Karl Roden, Mark Waschke as Habermann, Hannah Herzsprung as his wife, are really good. This entry was posted in History, Movie, Reviews, True Story, War Movie, WWII and tagged Ben Becker, German movie, Hannah Herzsprung, Karl Roden, Mark Waschke, Movies, Review, Sudeten Deutsche, Trailer, True Story, War Movie, WWII. Nice! Thanks for bringing this one under the spotlight. It must have been quite lonely in Czechoslovakia to be both an ethnic German and not a nazi supporter. In the 1935 election the Czech Sudetendeutsche Partei, whose official policy was rattachment to the Reich, scored an impressive 15% overall, and 2/3rds of the votes in the Sudeten region. I wonder if this is mentioned in the movie, that the conflicts didn’t start with the 1938 annexion. By the way, roughly the same thing happened at the same time in areas of Poland with a majority of ethnic Germans: local nazi-affiliated parties won the elections with very high numbers (not as high as in Germany of course, as they were not the only parties autorized to compete). And sure, the aftermath of the defeat was terrible for the Volksdeutsche, more than 10 millions of which flew or were deported to Germany from Central and Eastern European countries, with serious casualties. But then, since a lot of them were heavily involved in the Reich’s expansion, I sometimes wonder if the situation wouldn’t have been a lot worse without this massive ethnic recomposition. I’ll definitely try to watch this one, as I’m quite curious about how a German production today would tell that story. In Hungary lately, rightwing and far-right parties have been competing for the vote of ethnic Hungarians living in neighboring countries… brrrr. They focussed a lot one man’s story that why we don’t get a feeling for how man were Pro-Nazi but it’s in the movie too as the younger brother together with many more, joins up immediately. That there might have been tension and difficulties before 1938 is implicit there but not explicit at all. I’m afraid they were aiming for a bit of a Schindler’s List thing here. The story overall howver is rather sadder. I’m mean Haberman’s personal stry. It will be interesting to hear what yout think of it. I could imagine that some of those Hungarians would be supportive. That sounds familiar. Unfortunately the movie is much more German than Czech. It has zero humour. I’ve seen a few quite tragic Czechoslovak movies and the black humour was a trademark. Intriguibg review. Obviously I had never heard of it and most likely will not be able to find it. I am pretty shocked that there is a movie about the Sudetenland. Tha trailer say “North American” trailer so it might be possible you’d find it. It’s not a bad attempt. Shocked? Jan Hrebek’s Divided We Fall (2000) was also about the same place, people and time. But with a different angle. Thanks for that, I didn’t know that. I’ll try to get it. There’s also Jiri Weiss’s first fiction film, Stolen Border (1947). Haven’t seen it either, the DVD has english subs. More about it on imfdb. Thanks, I’ll look that up as well. I hadn’t heard of this one, Caroline. Don’t know if it’s available her, so I’ll have to track down a copy if I can. Like I just said to Kevin, as the trailer is North American, it could be available. 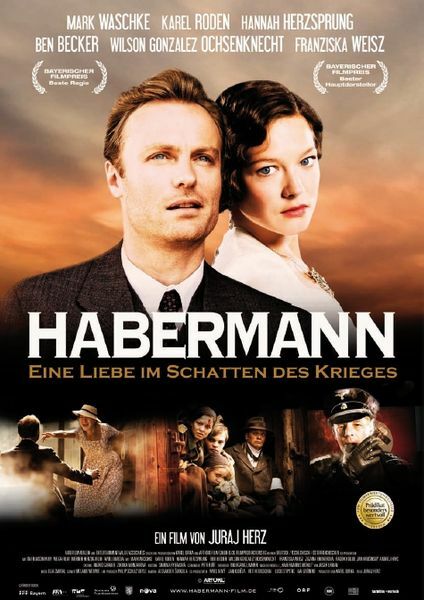 It’s available in the US here: http://www.corinthhomevideo.com/products/habermann – They also have an Amazon.com shop. I finally watched it, and found it quite good indeed. It’s very efficient in the depiction of long-withheld hatreds, family & village secrets, ordinary people not having a clue, and people under the spotlight (due to their social standing) either being caught between the devil and the big blue sea, or desperately trying to take tokens on both sides – a common phenomenon in nazi-occupied Europe. This culminates in the absurdist mechanic which grinds people in the end – like a deadly mill, precisely. Yet since local politics, which were very important, are left entirely apart it’s more a study in human madness than a global perspective on that era in the Sudetes. I’d advise those not familiar at all with that piece of History (between the early 30s and the end of the 40s) to read a bit before watching it. PS: I agree with you on Ben Becker’s part alas being over the top. His role as a ‘nazi ex-machina’ unfortunately bears the whole weight of politics on his shoulders, hence I think he pays for the film’s assumed stance in that matter. But he has wide shoulders. I am glad to hearyzou liked it. It is one of those movies I will watch again but Ben Becker really was a bit too big for it. He is the Uebervillain, so to speak, which gave the story a bit of a drift into the wrong direction. Still, better than many other movies.